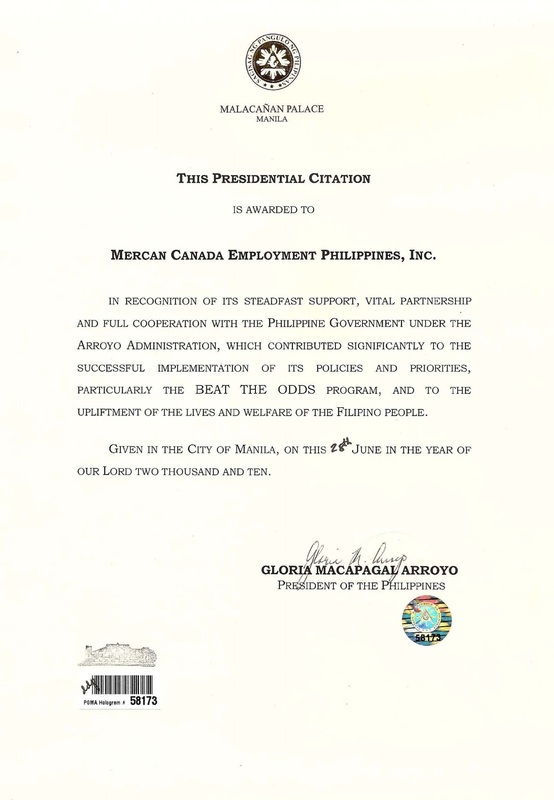 Awards & Recognitions | Mercan Canada Employment Philippines. Inc. Most Outstanding Manpower Agency for Canada (Metro Manila Awards) bestowed by Dangal ng Bayan Awards for Product and Service Excellence. People’s Choice Award Most Outstanding Manpower Company bestowed by National Consumer Affairs Foundation of the Philippines (NCAF). 2009 Most Outstanding Manpower Agency for Canada (National Awards) bestowed by Dangal ng Bayan Awards For Product and Service Excellence. 2009 Asia Pacific Excellence Awards Most Outstanding Canada Employment Provider Company bestowed by Asia-Pacific Excellence Citation. 2009 Global Excellence Award for Most Outstanding Manpower Company bestowed by the Global Excellence Awards Committee. 2009 Most Outstanding Manpower Company National Awards – Consumer Quality Award conferred by Dangal ang Bayan/Who’s who in the Philippines. 2009 Best Manpower Agency for Canada National Awards conferred by Pillar Awards for Marketing Excellence. 2010 Most Outstanding Manpower Company conferred by the Consumers Choice awards organization. 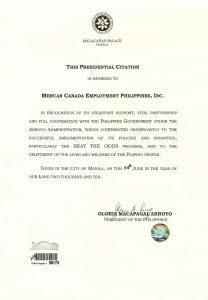 2010 Presidential Citation from the President of the Republic of the Philippines for providing support to their projects in the Philippines. 2010 Global Excellence Award for Most Outstanding Manpower Company bestowed by the Global Excellence Awards Committee. 2010 Most Outstanding Manpower Company awarded by the Asian Star Quality Committee in Malaysia. 2011 Asia Pacific Excellence Awardee for Most Outstanding Manpower Company conferred by Asia-Pacific Excellence Awards and Asian Consumers Choice Awards Committee. 2011 Consumer Quality Awardee for Best International Manpower Company bestowed by Consumer Quality Awards Committee. 2011 National Awards Best Manpower Agency for Canada given by the People’s Choice Awards committee. 2012 Dangal ng Bayan Awards for Product Excellence and Service Excellence for Most Outstanding Manpower Agency for Canada awarded by Dangal ng Bayan Awards Committee and Top Minds Research and Events Planner. 2012 Annual Global Brand Awards for Most Outstanding International Manpower Company awarded by Global Excellence. 2013 People’s Choice Awardee for Best International Manpower Company awarded by People’s Choice and Seal of Excellence. 2013 Asia Pacific Excellence Awardee for Best International Manpower Company conferred by the Asia Pacific Excellence and Asian Achiever. 2013 Top Brand Philippines Awardee for Best International Manpower Company given by the Consumer Choice and Top Brand. 2013 Consumer Quality Awardee for Best International Manpower Company awarded by the Consumer Quality and Best Brand Awards. 2014 Asia Pacific Excellence Awardee for Best International Manpower Company given by the Asia Pacific Excellence. 2014 Seal of Excellence Awardee for Best International Manpower Company conferred by the Seal of Excellence. 2014 Business Excellence Awardee for Best Overseas Employment Company for Canada awarded by Star Brand Philippines. 2014 Global Brand Awardee for Best International Manpower Company awarded by the Consumer Choice Awards Group. 2014 Consumer Quality Awardee for Best International Manpower Company awarded by the Consumer Choice Awards Group. 2014 Consumer Choice Awardee for Best International Manpower Company awarded by the Consumer Choice Awards Group. 2015 People’s Choice Awardee for Best International Manpower Company given by People’s Choice Awards Committee. 2015 Asia Pacific Excellence Awardee for Best International Manpower Company conferred by the Asia Pacific Excellence Awards Committee. 2015 Seal Of Excellence Awardee for No. 1 International Manpower Company given by the Consumer Award Committee. 2016 Seal of Excellence Awardee for No. 1 International Manpower Company conferred by the Excellence Consumers Quality Committee. 2016 Global Awards for Marketing and Business Excellence as the Best Manpower Agency For Canada given by the Global Awards for Marketing and Business Council Philippines.